Where Do German and Dutch Companies Outsource Software Development? Find out how company size influences the choice of an outsourcing destination. Continue reading to see the results of our yearslong research in the form of interactive statistics and learn the conclusions of our business development experts. Where Do DACH Countries Outsource Software Development? 127 companies in the DACH region (101 in Germany, 22 in Switzerland, and 5 in Austria) indicated their outsourcing destinations. On the basis of the data collected, we’ve calculated that 75.58% of DACH hire developers for their projects in Europe, 20.48% in Asia, 3.15% in Africa, and only 0.79% in South America. Due to the fact that the majority of DACH region respondents are German companies, we’ve decided to concentrate our further research on software outsourcing patterns among German companies. Where Do German Companies Outsource Software Development? Our research shows that 77% of German companies we surveyed outsource IT projects to Europe, 18% to Asia, 4% to Africa, and 1% to South America. Convenient time zones and access to a large tech talent pool make Europe the most attractive outsourcing region for Germany. Czech Republic, Serbia, and Spain were correspondingly chosen by 3% of German respondents. Lithuania, Slovenia, Egypt, and Croatia are outsourcing countries of the same number of our respondents—2%. 15% of German respondents outsource software development projects to other countries which include Macedonia, Vietnam, Slovakia, Tunisia, Turkey, China, Brazil, Palestine, Thailand, etc. - some Asian countries including India. What percentage of German companies surveyed outsource to the countries listed below? How Does Company Size Influence the Choice of an IT Outsourcing Destination? We studied German companies that outsource to the top 5 countries according to their sizes and detected how enterprize size affects outsourcing decisions. Where do German companies outsource depending on company size? Small (11-50 employees) and medium-sized (51-200 employees) companies from Germany tend to outsource IT projects to Ukraine and Poland, while large enterprises (201+ employees) in combination with either micro, small (11-50 employees), or medium-sized businesses (51-200 employees) prefer India, Romania, and Belarus. 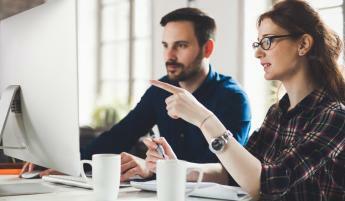 "Smaller and mid-sized businesses with less than 500 employees need to focus more recruitment efforts on middle and senior software developers. Like any other company, they need highly talented people to build well-functioning software in a reasonable amount of time. As opposed to junior developers, this target group is a challenging task to attract both for smaller German and Dutch companies. Firstly, it’s easier for larger companies to attract senior level talent, because they can offer higher salaries and more perks. Secondly, senior developers don’t tend to change their workplaces regularly. So it takes a lot of effort and resources to bring them on board. Thirdly, in cities like Munich, Berlin, Stuttgart Region, Hamburg or Frankfurt small and mid-sized businesses are competing with large corporations for local talent. I think that when small and medium-sized companies consider outsourcing, they prefer European countries such as Ukraine, Romania, Poland, and Belarus for several reasons. They receive fast and direct access to a pool of software developers with a solid technical education, with at least several years of commercial experience, little time zone difference and a great price quality ratio. In short, Europe is an attractive destination for those looking to produce high-quality software in an agile atmosphere with constantly changing requirements and new feature requests. Companies with more than 500 employees or more than 50 million in turnover have more opportunities to accumulate tech talent with different seniority levels locally, which means their main outsourcing need isn’t centered around finding missing talent. Instead, their goal is to build large offshore development teams that will function independently and substantially cut costs. And by large I mean 50+ staff. The Indian software outsourcing market is capable of fulfilling this need: The number of available software engineers is huge and the time zone disparity isn’t that important when fully functional business units are outsourced. This is the main reason German corporations are attracted to this destination. What often surprises them in hindsight are the differences in perceptions and approaches to software development they had to learn to consider while outsourcing software development projects to Asia." 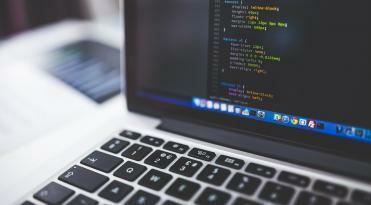 Where Do Dutch Companies Outsource Software Development? 84 companies in the Netherlands revealed their outsourcing destinations and based on the indexes collected, we found that 66.60% of Dutch companies outsource software development to Europe, 28.80% to Asia, 3.60% to Africa, and only 1% to South America. Dutch outsourcing statistics repeat German patterns, proving that countries share similar preferences, such as a minimal time zone difference and access to a wide talent pool. Where do Dutch companies surveyed outsource software development? Serbia and Bulgaria were both chosen by 3.50% of Dutch companies. Czech Republic, Macedonia, Hungary, Russia were all indicated by the same number of companies surveyed—2.30%. Over 18% of Dutch businesses outsource IT services to other countries, including Pakistan, Georgia, Vietnam, Spain, Philippines, Egypt, etc. - Romania, Ecuador and India. What percentage of Dutch companies surveyed outsource to the countries listed below? How Does Company Size Influence the Choice of IT Outsourcing Destination? To strengthen our preceding research, we studied Dutch companies that outsource to the top 5 countries according to their sizes and determined how business scope influences the choice of an outsourcing destination. Where do Dutch companies outsource depending on company size? Based on Daxx calculations, micro (1-10 employees) and small companies (11-50 employees) in the Netherlands outsource to Ukraine and India; small (11-50 employees) and medium-sized (51-200 employees) outsource to Romania, Poland, and Belarus. "The majority of companies prefer to have their remote team closer to home—66.60% of companies have their teams in Europe. Dutch companies value clear communication and face to face contact, which is easier to achieve when you are working with a team from a similar cultural background and same time zone." India is also a preferred option for larger companies that have established, more rigid, development processes. Interesting to note that the tech talent pool in India is approximately 20 times larger than in Ukraine but they are only slightly more favored by Dutch companies in our research. Nevertheless, India is a popular option for smaller companies that work in competitive industries where margins are tight and the workload is not overly complex, such as certain web development projects." Our self-conducted research depicts similar software development outsourcing patterns between Germany and the Netherlands. Both Dutch and German companies prefer outsourcing to European countries, namely 66.60% of Dutch companies and 77% of German companies. The Netherlands and Germany also share the same pattern concerning other outsourcing destinations: 28.80% and 18% correspondingly outsource to Asia, 3.60% and 4% to Africa, and only 1% of either countries outsources IT projects to South America. Furthermore, country-level research illustrates that the Netherlands and Germany share the same top 5 software outsourcing countries: Ukraine, India, Romania, Poland, and Belarus. Ukrainian IT industry boasts a thriving tech environment, which continues growing yearly—Ukraine was recognized as the 2nd largest IT export industry of 2018, there are 4000+ tech companies, and 1000+ IT events held annually. Software outsourcing services in Ukraine brought in an income of around $3.6 billion in 2017 (3.4% of the country’s GDP). The high-profit rates take their roots in the rapid growth of tech market in Ukraine—throughout 2017, the software outsourcing market in Ukraine has grown by 20% and is expected to reach $8 billion by 2025. 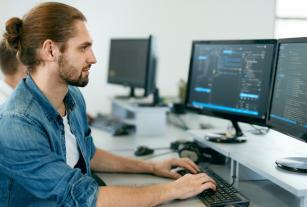 Currently, there are around 185.000 software developers in Ukraine, and the number keeps growing, as Ukrainian technical faculties produce 36.000 professionals annually. The majority of software developers in Ukraine are concentrated in the 5 top tech hubs: Kyiv, Kharkiv, Lviv, Dnipro, and Odessa. Provide you with comprehensive support whenever you have questions. To find out more about cooperation with Daxx fill the form below and we’ll get back to you soon.